Manwati, 38, has been trying her luck with the hand-pump for close to two hours now. The effort has yielded half-a-bucket of water. Exhausted, she gives up and decides to walk to another hand-pump about two kilometres from her village Saliaya Karrah with her neighbour Kapoori. “This is the only hand-pump in the village but it also has started to run dry. I have to finish cooking for my three children before dark because we usually have a night-long power-cut starting 6:30 pm,” Manwati says. It’s already 5:30 pm and she has another hour to get water. 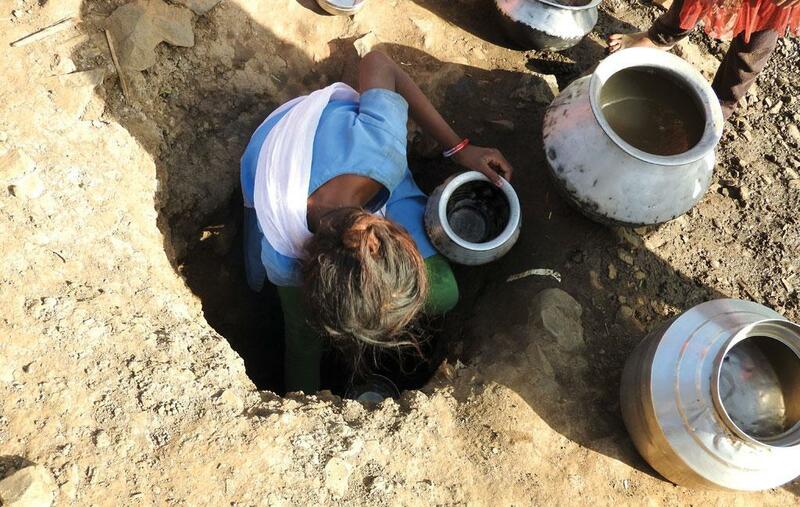 Manwati is just one of the many women in Bundelkhand, a region in central India comprising 13 districts of Uttar Pradesh and Madhya Pradesh, who have to struggle for water everyday. 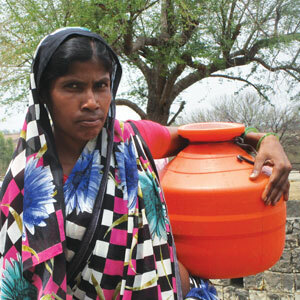 Her village lies in Uttar Pradesh’s Mahoba district, an area that has always faced water shortage. But the situation has turned particularly grim in the past couple of decades. 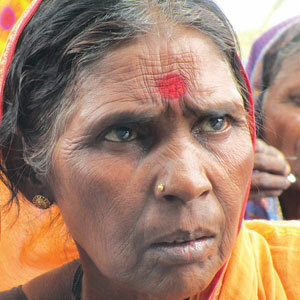 Manwati’s husband works as a daily wage labourer in Mahoba. Her father-in-law, Lall Chaturvedi, owns three hectares (ha) but has not farmed in the past two years because there is not enough water. He took a loan to buy a tractor three years ago but has not been able to deposit his annual instalment of Rs 1 lakh since last year. The bank has been sending recovery agents to their house who abuse them. The family is worried that Chaturvedi might commit suicide. As per official figures, 27 farmers have committed suicide between June 2015 and March 2016 in the district. 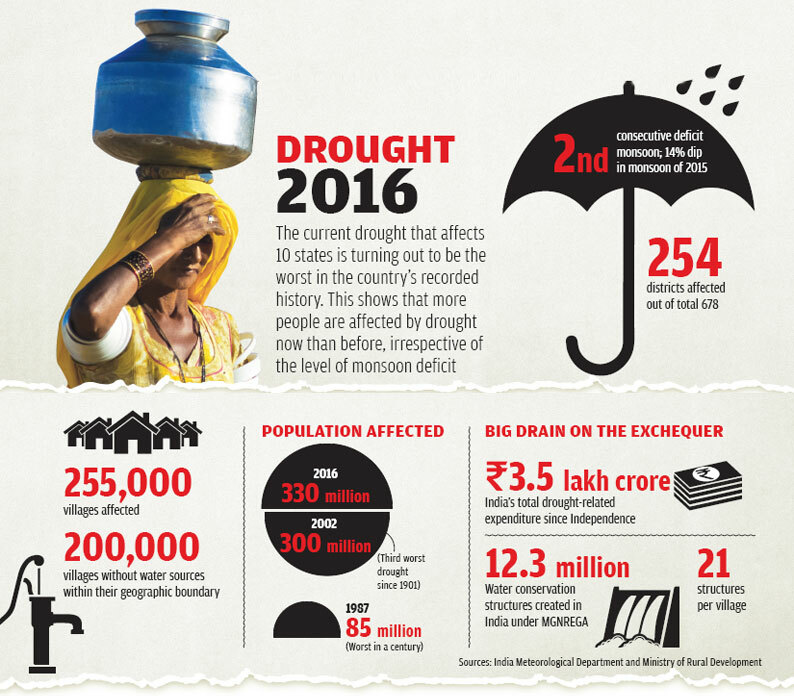 The water crisis has also caused crop failure, riots, caste violence, and large-scale migration. 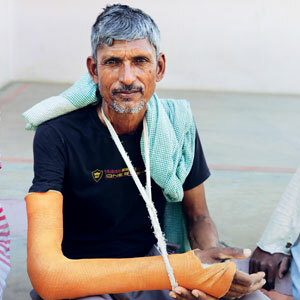 In Kabrai block of the district, for instance, Manoj Basor, a sweeper, was beaten up by higher caste men for touching a hand-pump. “I belong to an untouchable caste. I was thirsty and dared to use the hand-pump to take a glass of water. Apart from attacking me, they have also filed a police complaint,” claims Manoj, showing his wounds. Officials at the Kabrai police station say that water-related crimes would increase as the summer reaches its peak. “Last year more than 50 such incidents were reported in our police station. This year, till the first week of April, we have already had five cases,” says Raj Bahadur Singh, a constable at the police station. 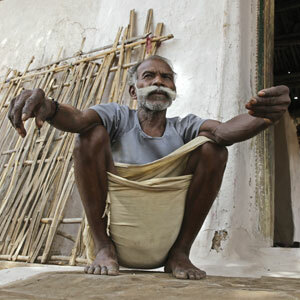 “Here, might is right,” says U N Tiwary, a retired bank official who lives in Kabrai. Water tankers are looted as soon as they arrive. Last time, Tiwary could only manage three buckets and that too because the distribution was done under police protection. He has to survive on these three buckets for around four days. His wife has gone to live with her children in Bhopal till the monsoon arrives. 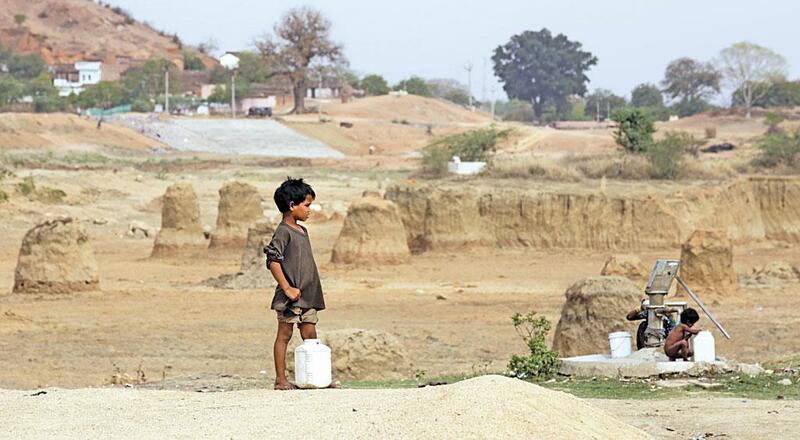 This is the 13th drought Bundelkhand has witnessed in the past 15 years. But this was not always the case. As per government data, in the 18th and 19th centuries, the region faced droughts once in 16 years. The frequency increased and between 1968 and 1992, there was a drought every five years. 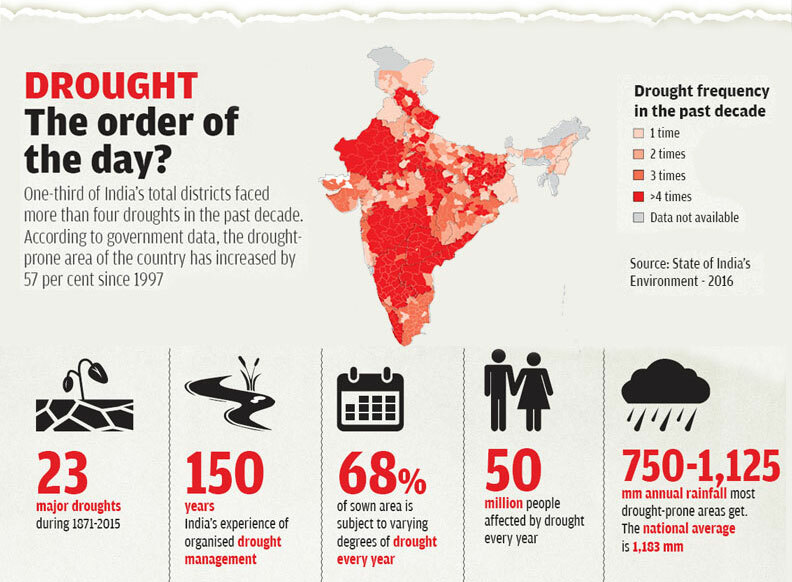 Between 2004 and 2008, four consecutive droughts ravaged the region. Except 2013, all the years between 2009 and 2015 saw deficit monsoon. 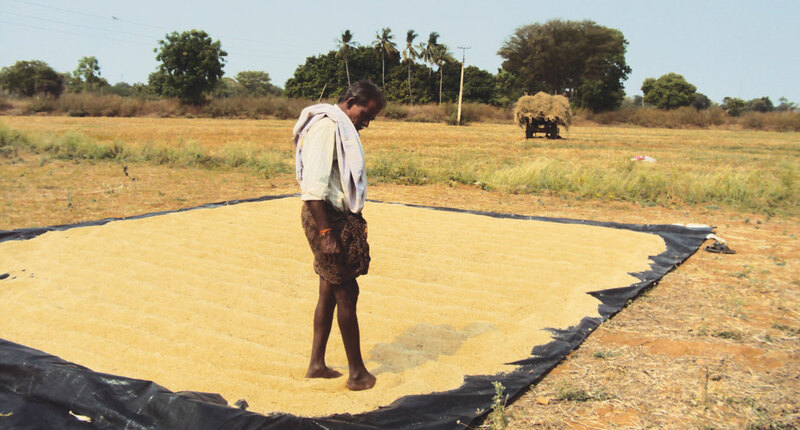 “Even in 2013, excessive rain in February and heavy monsoon damaged 60 per cent of rabi and kharif crops,” says Rajendra Nigam, project coordinator of Mahoba-based non-profit Grammonatti Sansthan. The drought has also resulted in the 15th consecutive crop failure. 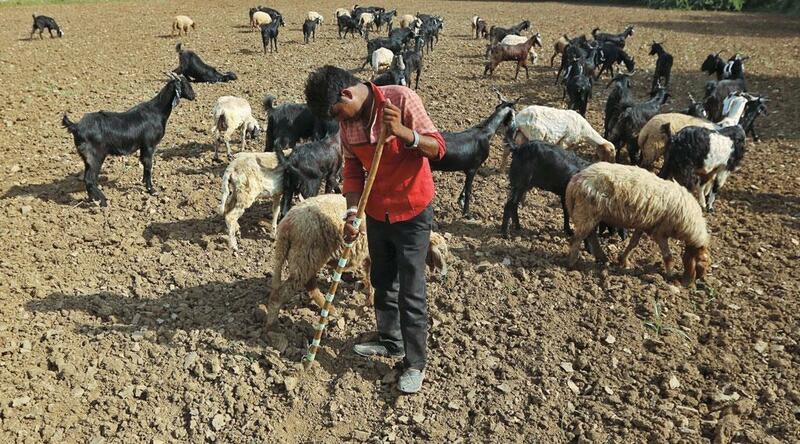 According to the Uttar Pradesh government, its Bundelkhand districts lost 70 per cent of rabi crop due to the drought this year. The state government has demanded a compensation of Rs 205 crore for farmers from the Centre. Rakesh Agnihotri, a marketing inspector from the department of food and civil supply, says he and his team waited at the godown in Charkhari block of Mahoba for the entire first week of April to purchase wheat at the minimum support price (MSP) from farmers but not a single one turned up. This despite the state government fixing the MSP of wheat at Rs 15,250 per tonne—a 5.2 per cent increase from the previous year’s rate. “Generally, this doesn’t happen,” says Agnihotri. “We organise collection centres after much publicity. Farmers usually start coming from day one. This signifies that the drought has been quite severe. Either the farmers did not cultivate crops at all due to water shortage or the productivity was very low,” he adds. Continuous crop loss for more than a decade has also pushed up the production cost. Experts say farmers are spending beyond their capacity on irrigation. The long spell of drought has also caused large-scale migration. Unable to sustain livelihood by agriculture, farmers are forced to work as labourers in cities. 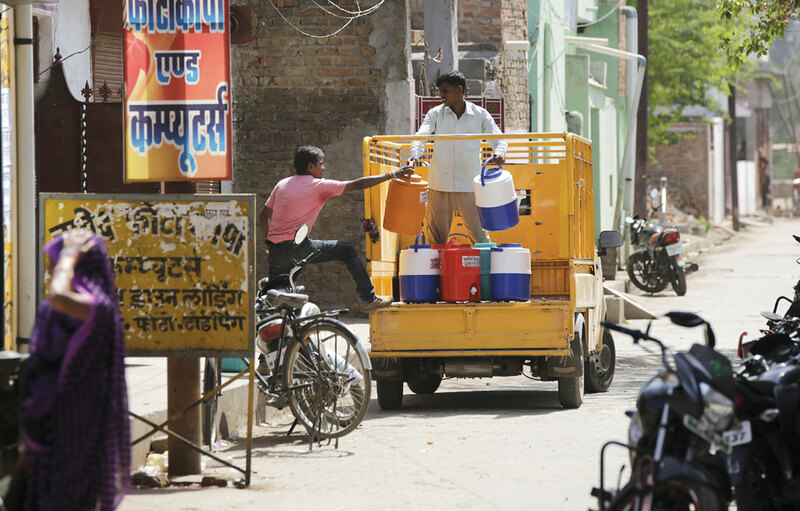 As per a government estimate made during the polio immunisation drive in 2015, about 6.2 million people have migrated from Bundelkhand in the past 15 years, says Ashish Sagar of Banda-based non-profit Prawas. He was involved in the preparation of the report. Another fallout of the perpetual drought is stray cattle. Unable to provide fodder, farmers just let them go. There are no figures for the entire Bundelkhand region, but government estimates say just the Chitrakoot division has 0.36 million stray cattle. This is 20 per cent of all the cattle in the division. Bhori Devi, 38, of Ajimika village in Mahoba had to work as a labourer after her standing crop was destroyed by stray cattle this year. She owns 4 ha but grew wheat on only half a hectare because there was not enough water. Even this crop was destroyed. “We took a loan and invested Rs 50,000 in agriculture, which has to be repaid,” she says. 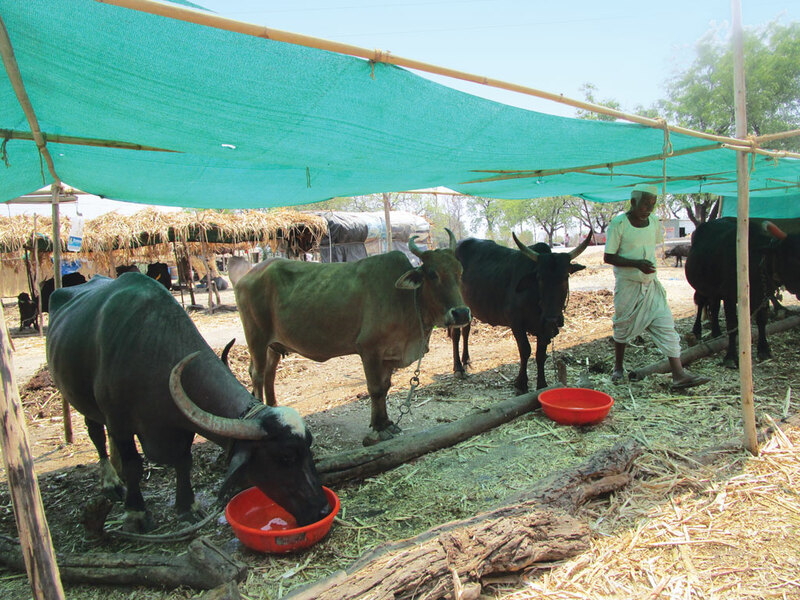 The problem is so severe that Saroj Dwivedi, the woman village head of Ajnar, won the recent panchayat election on the promise of safeguarding fields from stray cattle. In areas where the victory margin is usually less than 50 votes, she won by 1,600 votes. 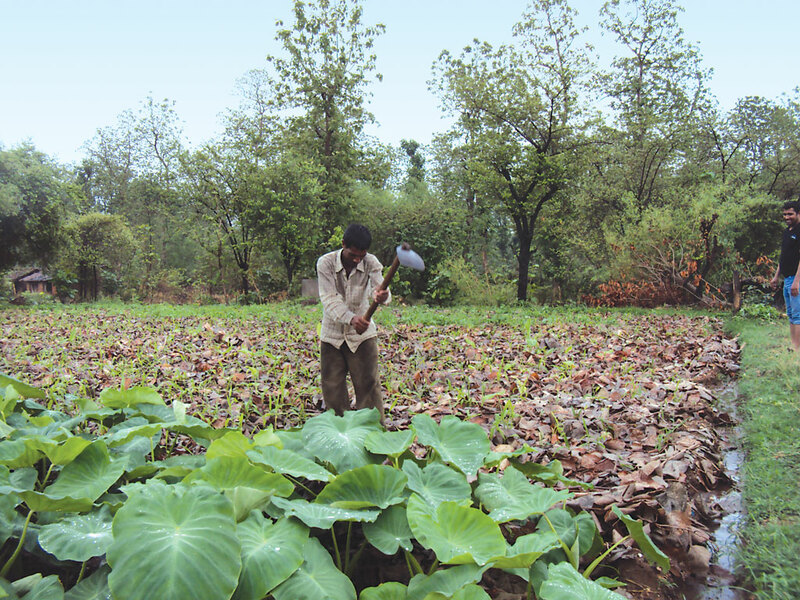 “Even I couldn’t believe it,” says Saroj, a big farmer. “My husband had started taking care of around 500 anna pashu (disowned cattle) during the election campaign and people voted for us,” she adds. 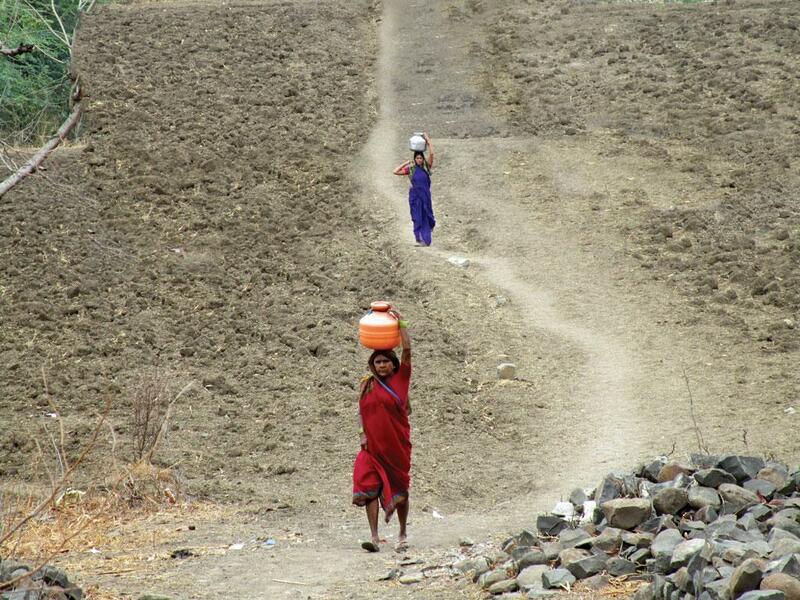 So why has Bundelkhand not been able to prepare for drought despite suffering it for such a long time? It should have, because the Central government has spent Rs 15,000 crore in the past decade to create water-harvesting structures. The figure includes Rs 7,000 crore spent under the Mahatma Gandhi National Rural Employment Guarantee Act (MGNREGA) on drought-proofing the region and the Rs 7,266 crore package that the Centre announced after the four consecutive droughts between 2004 and 2008. It also includes Rs 577 crore that the Union ministry of agriculture allocated to support farming and allied sectors. 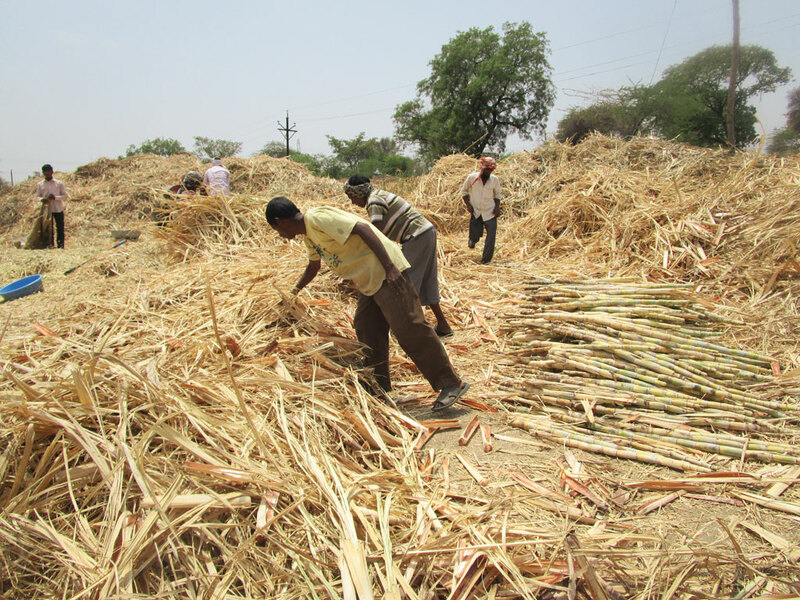 With all this money, over 116,000 harvesting structures have been constructed in Bundelkhand in just ten years (2006 to 2015). These include 700 check dams and 236 minor irrigation projects. This should have been enough to harvest rainwater to fight the drought. The answer to why Bundelkhand failed to prepare for drought lies in the kind of water-harvesting structures that have been built. Most are either technically flawed or unsuited to the terrain. For instance, the Sakaria reservoir. 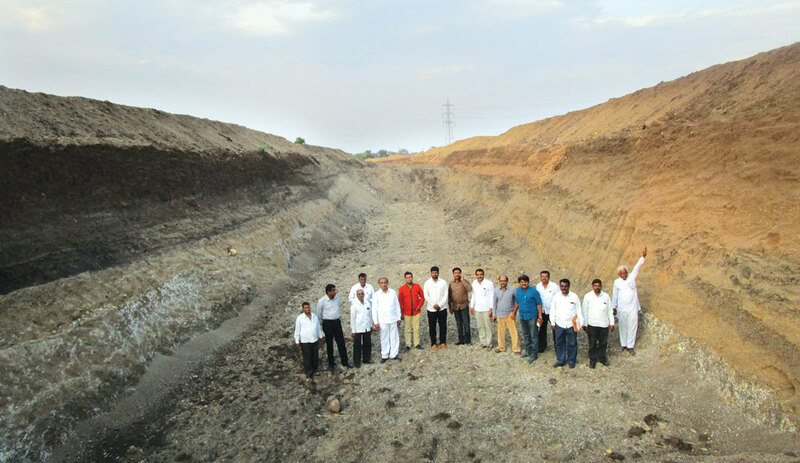 This 40 ha reservoir constructed at a cost of Rs 5.7 crore in Heerapur village of Madhya Pradesh’s Panna district was a non-starter because the gradient of the land did not slope towards the reservoir. 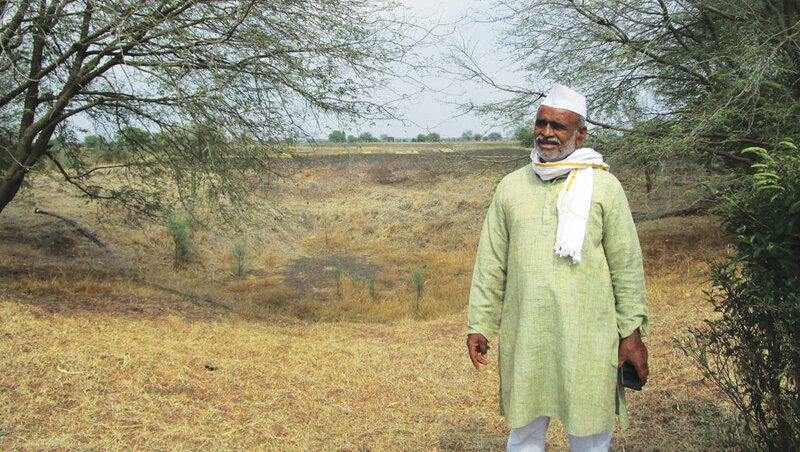 “Six years ago, I had pleaded with the district collector a number of times that the proposed site for the reservoir would not work because the slope was in the wrong direction,” says 65-year-old Shukru Gond of Heerapur. But the argument was dismissed because the project had been cleared by engineers. However, the knowledge of the village residents about the terrain proved correct. The reservoir that was announced as part of the Bundelkhand package to provide irrigation to 380 ha has now been declared defunct. The selected location of the reservoir was the result of caste politics, says Shukru. The site surveyed for the proposed tank was at Jamanhari village, a kilometre east of the current site. The area is low-lying and has two streams—Neman and Kaseha—that could have provided water to the reservoir. But the site was ignored because the Ahirs and Thakurs, the dominant castes of the village, did not allow it. The decision to change the location was taken overnight. The part where Gonds, one of the most backward tribes of the country, lived was selected and the residents were asked to relocate. Each family was paid Rs 40,000 as compensation. “Even rainwater does not stay in the tank for long. It seeps through the ground and spreads in the nearby fields,” says Pan Bai Gond, who lost her 1.2 ha to this failed tank. “At least the fields at our previous location were fertile. The ones that have been given to us are not,” says 60-year-old Sankar Gond. A few kilometres from the Sakaria site is Gunor block of Panna district. Here a check dam has been made on the Pereri stream. The problem is that the dam is on a plain land—the water never gains enough speed to be checked. The dam just ends up being an obstruction and causes the water to spread in nearby areas. The problem with Jaswantpura dam in Amanganj block of Panna is exactly the opposite. This dam was constructed with substandard material and developed cracks in its first year of operation. As a result, there is no water conservation. “All the water just flows through the dam,” says D P Singh, a teacher at a government school in Amanganj block. Yet another case is of Bhitri Mutmuru dam in Panna district. In 2013, one of the walls of the dam was washed away during the rain while construction was still going on. Bhitri Mutmuru, the village where the dam was being constructed, was also washed away. “A few people reportedly died. The matter was raised in the state Assembly. 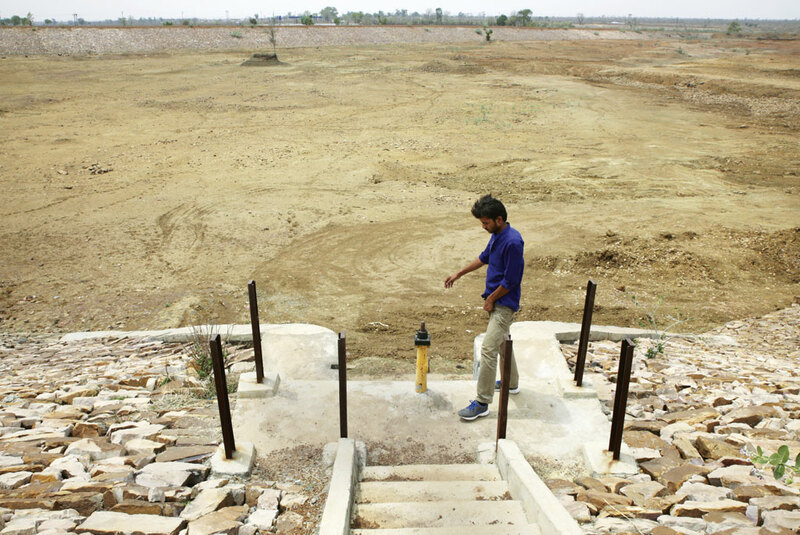 Renovation of the dam started last year,” says Sudeep Srivastava, a Panna-based activist. There are innumerable similar stories in every district of the region. Wrong constructions have also destroyed centuries-old ponds that were functional. One such pond is Chaand Sagar in Nagar Dang village of Mahoba. 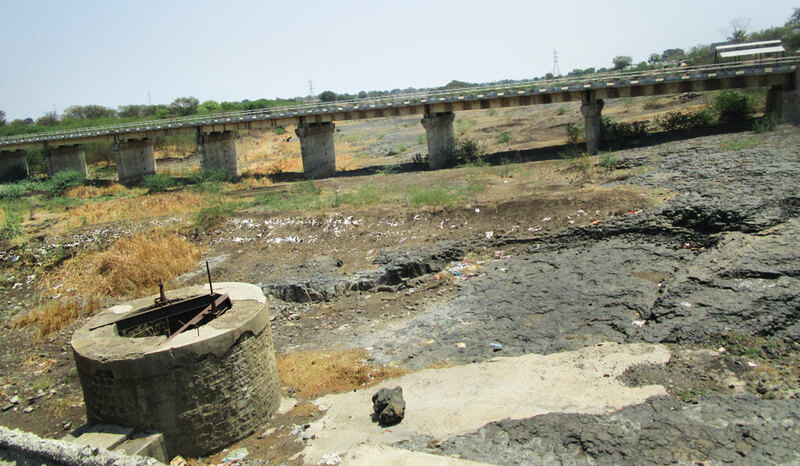 Constructed by the Bundela rulers, the pond is on the verge of extinction after the government declared it a model pond and decided to give it a “facelift” in 2012-13. As part of the initiative, walls were constructed around the pond, which blocked the flow of water from the catchment areas. 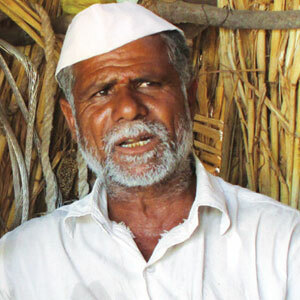 “The pond now lives up to its name—it can dry even under moonlight,’’ mocks Leeladhar Rajput, a farmer in the village. 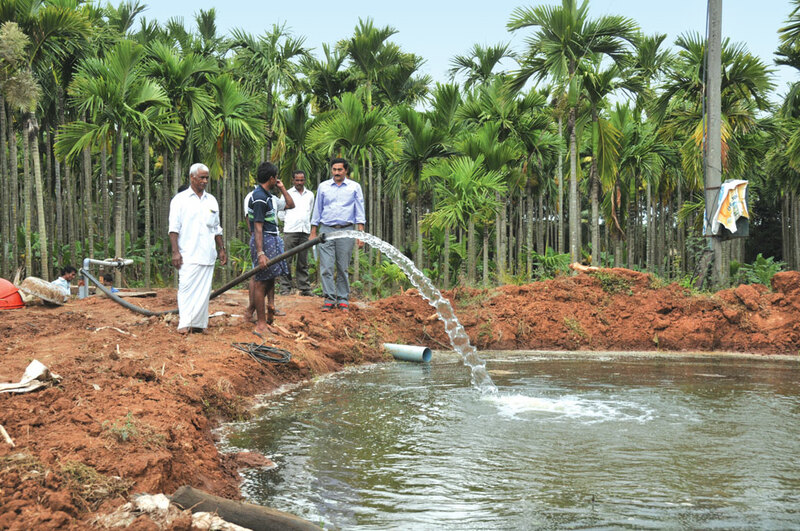 The initiative was part of the state government’s drive to build a model pond in every block. Bhanu Sahai, chairperson of the Bundelkhand Relief Package Monitoring Committee of the Congress party, claims that the money granted under the package has been totally wasted. “Nearly 90 per cent of the ponds dug under the relief scheme have turned out to be useless,” he says. 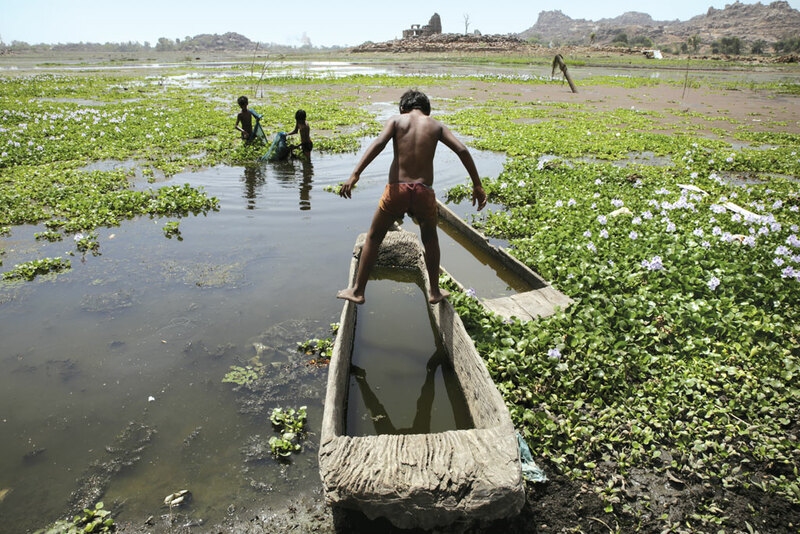 Since medieval times, local rulers and kings of Bundelkhand have built ponds. Some of these have lasted centuries and are still functional. Traditional wisdom suggests that ponds are best suited to the topography of the region. 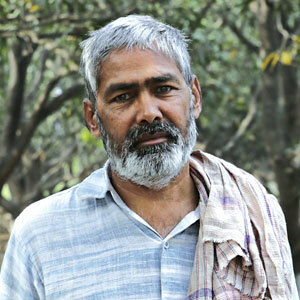 Agrees Pushpendra Singh, a Banda-based activist working on water conservation. Singh started a campaign to build 1,000 farm ponds along the banks of the seasonal Chandrawal river in 2013. These ponds would get filled up during the rainy season when the river is in full flow and provide water to farms for the rest of the year. Singh received support by the then Mahoba district magistrate Anuj Jha. The initiative was started in 2015 under MGNREGA. By then Jha had been transferred and the scheme underwent a complete overhaul. Now, it was proposed that 15 new check dams should be constructed on the river to harvest water. The 70 km river that flows through Hamirpur and Banda already has five check dams. One of the new check dams, constructed at Nathupur village, has an almost 2 m wall, which is too high for a check dam. It completely obstructs the flow instead of slowing it. Moreover, the dam has names of two different villages—Kasrai and Karhara Kala—painted on either side to falsely claim that two separate dams have been constructed for the villages. “No one knows how much money has been spent on the dam. That’s the state of corruption in the region,” say Singh. “Site selection for check dams cannot be done arbitrarily,” says Anuj Jha, now the district magistrate of Kannauj. “Our unit has never been consulted to conduct study for site selection,” says Anil Mishra, executive engineer at the Banda unit of the Central Ground Water Board. “One needs to know the total quantum of flow of water at the site. As per rules, 35 per cent of the total water must pass through the check dam to keep the river perennial. The rest of the 65 per cent can be used,” he adds. Mishra blames engineers of the irrigation department. “They make their own plans and implement them. As per the geography of the region, ponds are more suitable,” he says. One such pond is Heera talab in Hamirpur district’s Athgar village. The catchment area of this huge 120 ha pond has not been encroached upon. As a result, the pond has thrived for centuries. “We don’t know how old this tank is. It never dries, even in harsh conditions, like this year,” says Pancham Aarakh, 58, a village resident. The downfall of the pond system of irrigation started in the 1960s when land consolidation laws (chakbandi) were changed in several states, says Singh. Traditionally, landholdings were cut as per the availability of water bodies and it was kept in mind that every farmer had a water source for irrigation. As per the new laws, landholdings were cut in rectangular shape, ignoring water availability. Farmers, as a result, had to resort to other methods of irrigation. 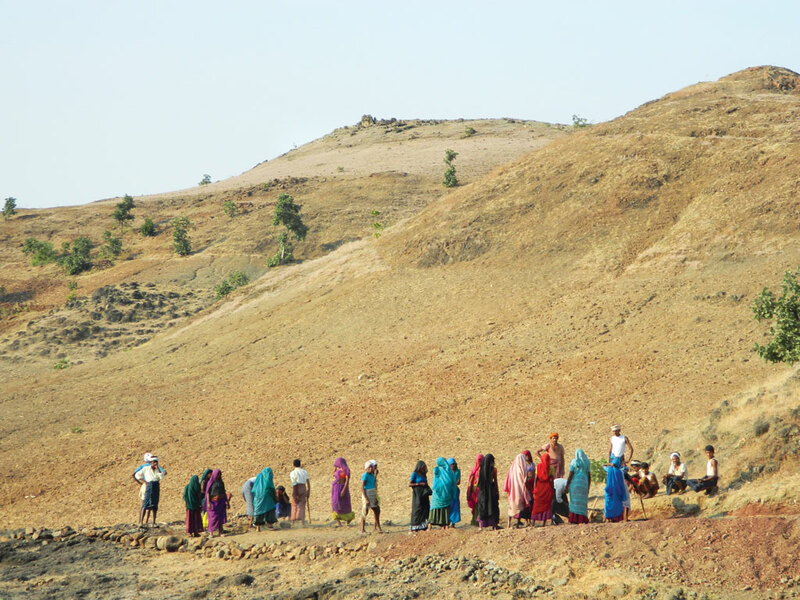 The impact of chakbandi was felt in the 1990s when droughts became severe. “The situation became acute in the 21st century. We had increased use of water but couldn’t recharge groundwater and failed to conserve surface water,” says Singh. As farmers looked for other methods of irrigation, traditional water bodies were neglected and became defunct. 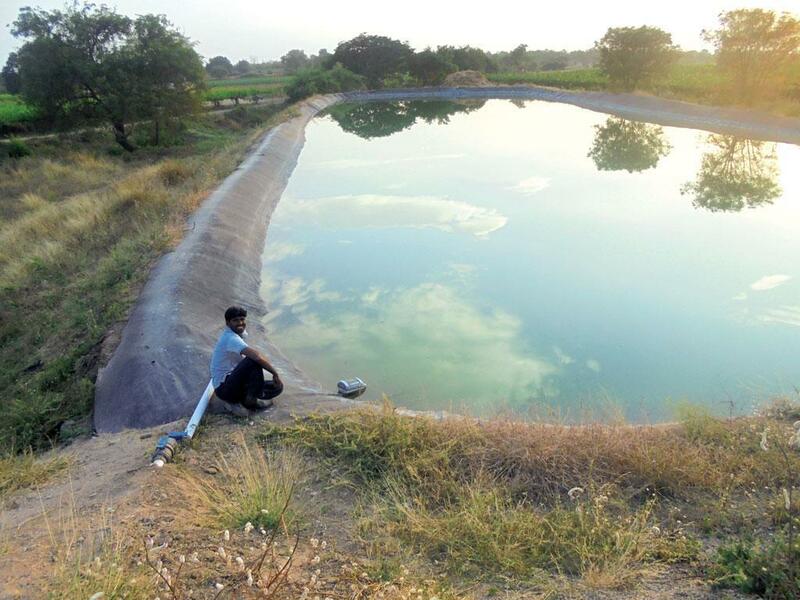 A 1983 report of the Bundelkhand Development Authority, Madhya Pradesh, states that the region had 9,407 ponds. Another report published by Banda-based non-profit Vigyan Sanchaar Sansthan says that the Bundelkhand region of Uttar Pradesh had more than 11,000 ponds till 1990. Of these over 20,000 ponds, now around 5,500 remain. “There is a clear correlation between the rising water scarcity in Bundelkhand and the falling number of water bodies,” adds Singh. The geography of this region allows quick recharge and discharge. “So ponds are most suitable for conservation of water. 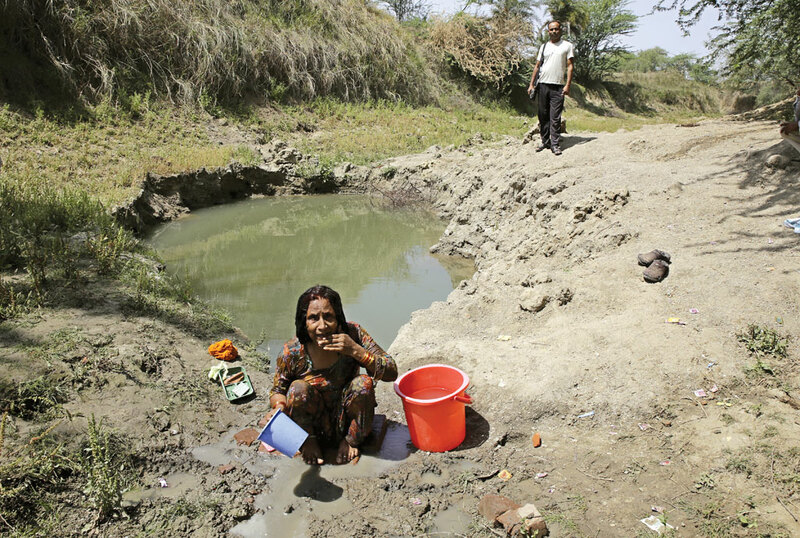 Exploiting groundwater will not help,” says Narendra Goswami, a Jhansi-based geologist. Moreover, groundwater resources in Bundelkhand are meagre because hard rocks like granite and gneiss do not allow water to percolate through the ground. On the other hand, the quartz reef that traverses through the undulating terrain of Bundelkhand provides sites where ponds can be formed, says Krishna Gandhi, a Jhansi-based activist who started Lokodyam Sansthan, a campaign for water conservation in Bundelkhand. “Many tanks built during the Chandela rule 1,000 years ago along these reefs can still be found,” Gandhi says. We need to identify traditional water bodies and revive them, says Pankaj Chaturvedi, a Delhi-based writer who has written two books on conservation and rejuvenation of traditional water bodies in Bundelkhand. 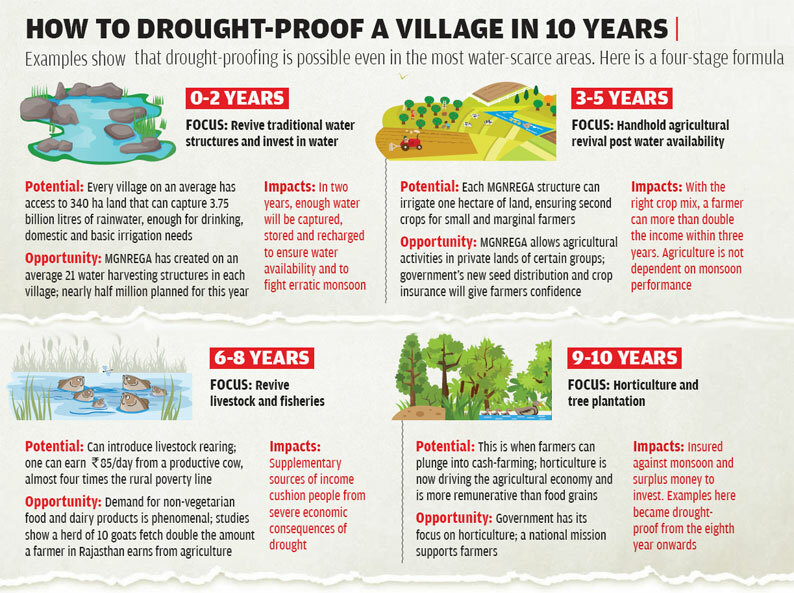 Till that happens, the region will not be ready to face droughts.